Enclave at Heritage Hills is a quaint community in Lone Tree, Colorado that welcomes homebuyers of all ages, who are drawn to the community's convenient location near Denver, Aurora, Littleton, and Highlands Ranch. The Enclave neighborhood is a gated subdivision of 122 single-family ranch homes within the master-planned Heritage Hills community. Homebuyers enjoy living in a tight-knit community that offers a clubhouse and vibrant social scene with community parties and activities. The clubhouse at Enclave at Heritage Hills is a private facility that is available exclusively to the homeowners and residents of the Enclave neighborhood. This social space is the perfect location to meet neighbors for a game night or holiday party. Homeowners can also rent out the clubhouse for their own private party. The clubhouse even has a kitchen that is perfect for catering your next event. Construction of Enclave at Heritage Hills began in 1998 and the community was completed in 2006 with 122 single-family homes. There are five floor plans that offer 1,624 to 2,184 square feet of living space. These single-level patio homes offer one to three bedrooms, two to two-and-a-half bathrooms, and an attached two or three-car garage. Every home has a den that can be utilized as a guest bedroom or extra entertaining space. Whether working or retired, homeowners have more time to enjoy their active lifestyles because they pay a reasonable homeowners association fee to handle outdoor chores. This association fee includes common area and building insurance, gated security, streets, landscaping, and clubhouse maintenance. Enclave at Heritage Hills is located in Lone Tree, Colorado. The community is situated northeast of Lincoln Avenue and Yosemite Street. The city of Lone Tree has an extraordinary amount of options to shop, dine, and play. One of the most popular shopping areas is located right in the city of Lone Tree. This area is known as Park Meadows Retail Resort and has over 185 stores and restaurants. Indoor and outdoor recreation is also available throughout the immediate area at Lone Tree Recreation Center, The Bluffs Regional Park, and Cook Creek Pool. Enclave at Heritage Hills is located just 30 minutes south of Denver and Aurora. Its convenient location is just 20 miles from downtown Denver, making it a short drive to see professional sporting events and world-class cultural opportunities at theaters. 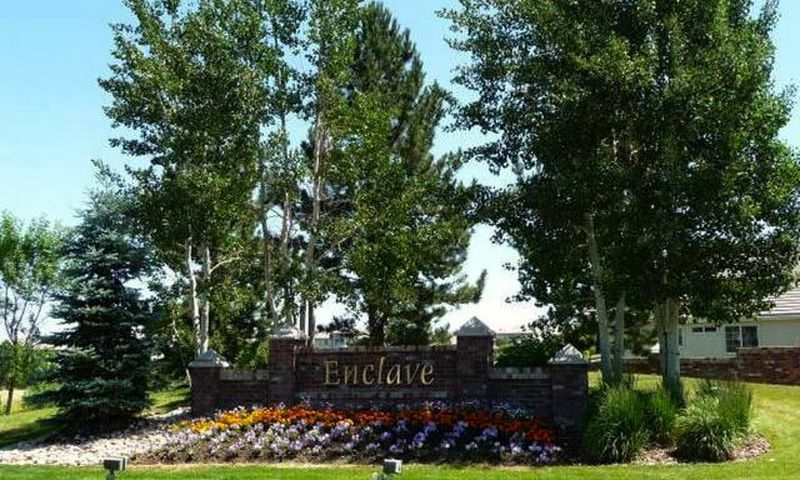 Enclave at Heritage Hills' close proximity to I-25 and E-470 makes traveling to Centennial Airport and Denver International Airport a breeze. With such a convenient location, it s easy to see why Enclave at Heritage Hills is a high demand neighborhood in Lone Tree. Check back soon for more information on the lifestyle in Enclave at Heritage Hills. There are five patio home floor plans that offer 1,624 to 2,184 square feet of living space. These single-level homes offer one to three bedrooms, two to two-and-a-half bathrooms, and an attached two or three-car garage. Every home has a den that can be utilized as a guest bedroom or extra entertaining space. We bought a resale home here a couple years ago and are very pleased. The quality is great and best of all, NO more yard work or shoveling snow for us! I also love living in a gated community because it just makes me feel safe and the community is very quiet. The people have been great and we're very involved now so our social calendar is really exciting! The location worked perfect for us being close to Denver and Aurora so we can easily visit our kids and grand-kids. But you don't need to venture too far from home to find everything you need, great parks, shopping and restaurants. 55places.com is not affiliated with the developer(s) or homeowners association of Enclave at Heritage Hills. The information you submit is distributed to a 55places.com Partner Agent, who is a licensed real estate agent. The information regarding Enclave at Heritage Hills has not been verified or approved by the developer or homeowners association. Please verify all information prior to purchasing. 55places.com is not responsible for any errors regarding the information displayed on this website.